TRIVIA of Noh : Q92 : Why are there many Noh stages on Sado Island? 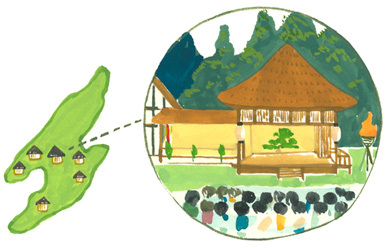 | Home | Trivia | Q92 : Why are there many Noh stages on Sado Island? Why are there many Noh stages on Sado Island? Sado Island is where Zeami, the creator of Noh, lived in exile. It has been closely connected with Noh through the ages; some medieval masks that remain on the island are believed to have been taken there by Zeami. Early in the Edo era, Sado, with its gold and silver mines, became a possession of the shōguns. Noh spread rapidly across the island after Ōkubo Chōan, the son of a Noh actor, was sent from Edo as gold mine magistrate and took some Noh performers with him, including actors, musicians and comedians. He made them perform Noh plays to dedicate a number of shrines around the island, opening up the art to a wide audience, including commoners, not only samurai. By the beginning of the Meiji era, Noh was flourishing on Sado, and more than two hundred stages were built there. According to a poet who visited the island in the Taishō era, even a hamlet of some ten houses had a Noh stage. More than thirty Noh stages remain today; some are prefecturally-designated folklore cultural assets or municipally-designated cultural properties. Eight are in active use for performances, almost certainly the highest per capita figure in Japan (the population of the island is only about 64,000). Designated one of the prefecture's folklore cultural assets, the stage of the Sado Hōshō school's head family, the Honma, is said to have been rebuilt in 1885 (Meiji 18) but is authentic in style, featuring crocks buried under floor for improved acoustics. Even now, regular performances are held in the last weekend of July for large audiences including tourists from outside of the island. Meanwhile, the stage of Daizen Shrine, famous for its back wall painting of an old pine tree with the sun, is a spectacular architectural structure featuring beautiful thatched roofs.